Whether you are a group or a solo traveller, you will find it super easy to meet new people and make Ondas your home. Whatever your needs, whether you want to just chill and relax, socialise with other guests, immerse yourself in local culture or party/dance on the weekends – you will find it here! Our European-style café serves a variety delicious food & drink options and is open from 9am-9pm. Enjoy premium coffee, all-day breakfasts, pizzas, sandwiches, bagels, milkshakes, pastas, brownies, croissants and much more! We welcome respectful travellers with positive attitudes and energies. Greta hostel it’s very close to the metro (main transport that’s easy and cheap). Very clean theres is lots of space to relax and a beautiful view from the balcony up top. The hostel is also a café I recommend you try the breakfast and coffee. Marvin the owner very knowledgeable and can help with what tours to do while in Medellin. The staff was amazing also helping in any way possible ale tina and fernanda were great! Thank you so much and I hope to come back here soon! My amazing Stay!!! 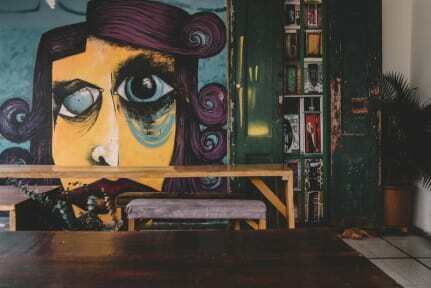 The Ondas hostel is an amazing place , the chill atmospheres leads to relaxing times and creative energy. Having the Cafe downstairs on street level is an added bonus. The quality of the food was better than most of the places we ate at out and about. The tab concept they offer for paying makes it really nice so you can just have a beer, drink water or food and deal with paying up at the end of your stay. Oh , I cant forget the rooftop bar and lounge area, super eclictic. no cups for your morning coffee...and there are only two bathrooms for women... but the place is nice, good vibes! great for backpackers! In a cool area of Medellin with a really nice cafe downstairs and a wicked rooftop bar but the beds are really uncomfortable. Good social hostel but could be cleaner. The downstairs cafe is cool but essentially everybody can just walk into the hostel and into he dorms since reception is in the cafe. My dorm did not have enough lockers for all beds and I had to lock my valuables in another room. Not enough bathrooms but a cool place to stay!